As a longtime Asterix fan, I've contemplated for a while putting together some kind of Asterix page. However, there are plenty of sites out there already covering most every aspect of the series (see my personal selection below or a more comprehensive list at Yahoo), including many devoted to the translations and a number which annotate each individual book. The challenge thus became to come up with something that would add to the knowledge available online, rather than merely duplicating it. Eventually, I settled on a particularly obscure piece of Asterix trivia: the Find Asterix book, which was published in 1998. Doubtless inspired by the Where's Wally? 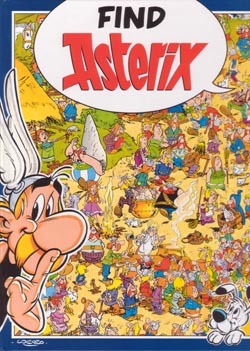 series, this book presents a dozen detailed double-page drawings of the Asterixian world, with Asterix concealed somewhere within. The drawings aren't actually by Uderzo (no artist credit is given, and the artwork lacks the meticulous detail of Uderzo's own work), but many are clearly copied from images within the series proper. It's not particularly difficult to 'find Asterix' in each of the images (the book is aimed at the youthful audience which the English language market seems to assume is the only one that reads Asterix). However, just in case anyone is having trouble, the solution for each is presented below, complete with the actual image of Asterix himself and a comment on the artwork. Whether this is actually a useful contribution I leave to the reader to decide! Asterix is on the far left of the left hand page, hiding behind a bush next to Fulliautomatix's hut. There are far more people in this shot of the village than we've ever been led to believe actually live there, and some of the regulars (such as Impedimentia and Geriatrix) aren't very well rendered. Asterix is almost in the centre of the left hand page, in amongst the group of Gauls rushing into the camp (which camp it is meant to be is not identified). The numbers of villagers and Romans are slightly more accurate than in the previous shot, but again some of the regulars (such as Geriatrix's wife) aren't drawn with great accuracy. This one's a little trickier. Asterix is on the right hand page, in the audience, about two-thirds of the way down the page. However, you could be forgiven for thinking Asterix is one of several audience members who have his height and helmet, but differ in other details (moustache or clothing colour). Asterix is in the audience in the bottom right corner, concealed within a group of Romans. The placement of the guards in the crowd seems fairly random . . .
Asterix is in the top middle of the right hand page, standing in a barrel and looking none too pleased about it. The Lutetia traffic jam is a familiar theme from several books (including Golden Sickle and Banquet), while the image of the young Roman rider being booked is a straight copy from the former. The drawing in the top left corner seems extremely lazy. Asterix is in the bottom left corner of the right hand page, peeking out from under the shields. The absence of any other Gauls (apart from Obelix) in this picture makes it one of the easiest pages in which to spot him. Asterix is in the thick of the fight, about halfway down the right hand edge of the left hand page. Unlike virtually everyone else in the shot, he's smiling. Again, the village seems a little overpopulated. Asterix is just visible squashed between two Roman soldiers in the water on the bottom half of the right hand page. While most of the drawings in this book strain credulity, the idea that Gauls would lounge around on a beach where four galleys are foundering on huge waves seems particularly silly. Asterix is hiding just behind the rightmost 'Come On Camulodonum' sign, and looking none too pleased about it. The image is heavily derived from the climactic football match in Britain, although here the multiple tackles seem to imply the existence of several balls. Asterix is just behind the dancing girls on the right-hand side, in what's probably his worst-drawn appearance in the book. Of course, he should be on the carpet at the top. The crowd sketching gets very lazy towards the back of the image! Asterix is barely visible standing in the boat directly behind Cleopatra on the left hand page. The image itself is largely reclaimed from Cleopatra, although if history is any guide Getafix should be looking at her nose, not the plans. Asterix is almost in the dead centre of the image (which accounts for the poor scan), his face partially concealed by another man's plaits. Aside from the overcrowding and Asterix's odd placement, this is a fairly typical banquet scene. There's also a bonus challenge in the book to locate the Chieftan's Challenge Cup of Gaul in one of the pictures; this one you can solve for yourselves! Regular newsletters, links to Asterix merchandisers, interview with Uderzo and other bits and pieces. The best overall guide to the books in English translation, with summaries of anachronisms, translations of other languages, inconsistencies, reviews and more. Well worth a visit!